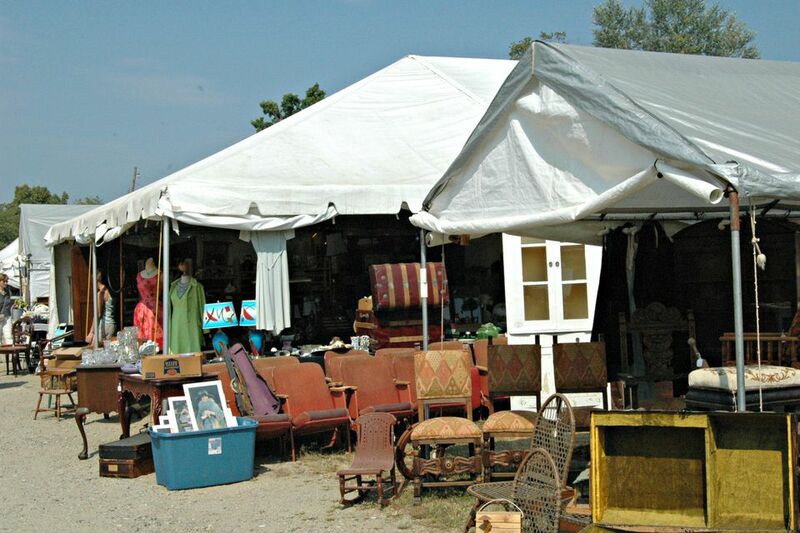 Brimfield Antique and Flea Market Shows started in 1959, when founder Gordon Reid, Sr. hosted 67 dealers in the field behind his Brimfield, Massachusetts home. Now 51 years later, the event is reported to be the largest outdoor antique show in the United States -- with 21 fields and more than 5000 dealers stretched along one mile of Route 20. Enjoy three Brimfield Antique and Flea Market shows per year in May, July, and September, each running from Tuesday through Sunday. Paid parking available, typically for $3 to $10. Though some dealers accept checks and credit cards, they prefer cash. ATMs located near the town common and in the food court of the New England Motel. Wear layered clothing and comfortable walking shoes. Consider taking a hat and rain boots in case of bad weather. Add sunscreen to your list for the July show. The May and September shows have the largest crowds and the most dealers. Dealers will usually hold purchases until you're ready to head to the car. Make note of the field name and booth number, and ask what time they'll close. Reserve motorized scooters in advance from Scootaround by calling (888) 441-7575. Concessions available from wide a variety of onsite vendors, or enjoy sit-down dining at local restaurants or the large food court at the New England Motel. Eat early or you won't get a table. Take a wagon or rolling cart, along with the rest of your flea market tool kit. Some, but not all, dealers provide shipping. For purchases from dealers who don't ship, try the UPS and Fed Ex dealer at Brimfield Acres North, or L Drew Gerald at May's Parking Lot. Porters sometimes available to transport large items to your vehicle or shipper. Don't be afraid to haggle. Most dealers are open to negotiation, especially on the last days of the show. Make cash offers on large or heavy items on Sunday afternoon -- when the dealers are getting ready to pack -- and you might get a steal. If you want to stay close, book lodging 9 to 12 months in advance. Try nearby towns for last minute accommodations. For help navigating the massive event, download the Brimfield Flea Finder app. The download is free.